No matter what age you are, you are never to old for Thomas & Friends. There is something timeless about watching and playing with trains and we have become obsessed with the TrackMaster sets that Fisher Price release. Not only are they a classic toy train set, but with motorised actions, you know the fun never stops. 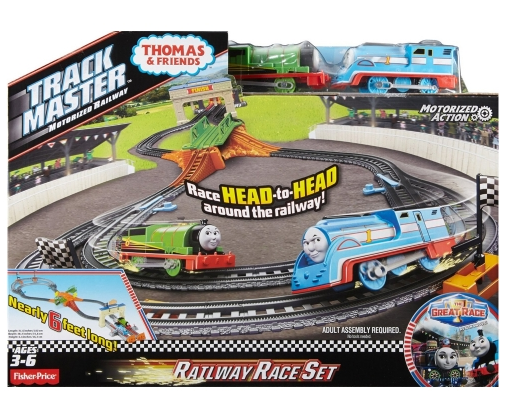 To celebrate the release of the Thomas & Friends The Great Race, we were sent a copy along with the new Thomas & Friends TrackMaster Railway Race Set. As with all TrackMaster sets, they are simple to put together, with lettered and numbered pieces and within 5 minutes we were ready to go. You do need batteries for the trains but they are simple to insert, and they last hours of fun. This TrackMaster set is nearly 6 foot long, so we set it up between two rooms in our flat. As the trains set off at the start of the course, they approach the bridge that then bursts open to allow them to continue their race. As they cross the finish line, there is a a celebration of fireworks and chequered flags before it's time to start again and continue the great race. We absolutely love this set, it's been one that we've had hours playing with. We've also added some of our other sets to make a creation of our own which is fantastic as all the TrackMaster sets are interchangeable. I love that the TrackMaster sets can grow with your children and they are fantastic for all ages (even us grown ups love playing with the sets!). The TrackMaster Railway Race Set was released to celebrate the release of the Thomas & Friends movie "The Great Race". It follows the best engines from around the world as they gather to compete in the great race. This was a fantastic full length feature and Max loved discovering all the new characters from around the world. I've attached the trailer below and the DVD is available at all good retailers. Thank you Thomas & Friends for letting us experience the Great Race!